With an exploration commercial success rate of more than 50% in the past decade, Sapura Exploration & Production (Sapura E&P) continues to set the benchmark in the industry for discoveries in both clastic and carbonate reservoirs. Our track record includes notable discoveries in shallow and deepwater environment as well as high pressure/ high temperature environment. We adopt a unique, proprietary approach based on understanding the complete petroleum system, the experience and technical know-how to de-risk the play for optimal success rates. We are backed by an experienced team of industry professionals who have operated globally in various petroleum basins and geological settings. We understand Asia better – we have a track record of more than 25 years of discoveries in China, Indonesia, Malaysia, Thailand and Vietnam. In 2014, Sapura E&P made five consecutive gas discoveries in the SK408 Block, finding about 3TCF gas in place. 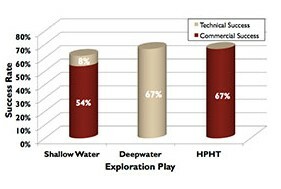 Our exploration commercial success rate has been more than 50% in the past decade. Sapura E&P aims for development and production within three years either by existing pipeline systems or Floating Production Storage and Offloading Vessels. Over the years, we have forged strong relationships with partners and regulators based on trust, integrity and technical expertise.